The concept of renovation insurance is rare in India, which is why it is important that you pay extra attention to the safety measures been taken by your contractor, both for the safety of your house as well as the labor on site whose health and safety is most often ignored. Here are some pointers on how to stay vigilant. Don’t allow smoking during construction. Remove combustible debris from site everyday. Store paints, solvents and combustible material safely. Also dispose of solvent stained cloth safely. Make sure that the labor is wearing protective gear: helmets, face masks, gloves etc. Keep the air clean: painting, sanding, adhesives etc. cause toxic fumes which should never be inhaled. Keep the fan on and try and do as much of the work outdoors as possible. Insist on keeping children (yours or anyone else’s) away from the construction, same for pets. Feel free to suggest any other safety tips you have in mind, in the comment section. How do you build an Earthquake-proof building? After the massive earthquake in Nepal, with the aftershocks still being felt, we felt it was important to share some pointers to ensure your structure is earthquake proof. 1) The building should be able to sustain as much side-ways motion as possible, in order to minimize damage to the structure and give the occupants time to get out safely. Effect of isolating the base of a building subject to a sideways ground movement. The most dangerous building construction, from an earthquake point of view, is non-reinforced brick or concrete block. Generally, this type of construction has walls that are made of bricks stacked on top of each other and held together with mortar. The roof is laid across the top. The weight of the roof is carried straight down through the wall to the foundation. When this type of construction is subject to a lateral force from an earthquake the walls tip over or crumble and the roof falls in like a house of cards. 2) Use light weight civil engineering materials as far as possible, especially for walls and roofs. 3) Cement mortar used should be in the ratio of 1:6 parts of sand. 4) The use of seismic bands: a seismic band consists of a concrete flat runner at the plinth level of the building and the lintel level of all doors and windows. 5) Use vertical reinforcement in brick walls. this reinforcement should start from the foundation and run through all the seismic bands. 1) Use of dampers,rollers, tire mats or other foundation cushion plates to allow for sliding. 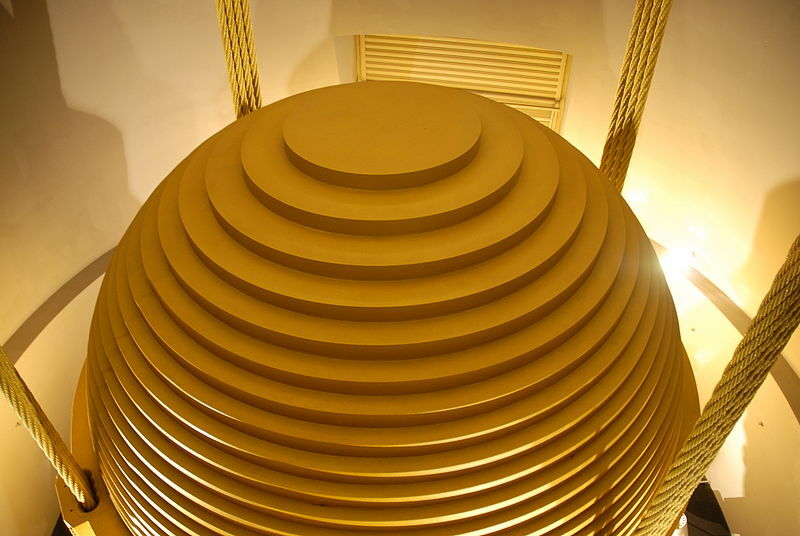 Tuned mass dampers are large masses built on top of buildings that can sway at the top of the building in opposition to the building sway. These devices can reduce the sway of a building up to 30 to 40 percent. 2) Expansion joints for larger buildings especially where 2 different types of foundations are being used. As the buildings get bigger and taller other techniques are employed such as “base isolation.” During the past 30 years, engineers have constructed skyscrapers that float on systems of ball bearings, springs and padded cylinders. Acting like shock absorbers in a car, these systems allow the building to be decoupled from the shaking of the ground. Remember, we cannot avoid earthquakes but we should prepare for them. Some of us sit on elevated thrones, while others squat above holes. Some of us cleanse ourselves with dry paper, while others employ a nearby pitcher of water. But then, there are some, who are way ahead, the Japanese, to be precise, who spend those crucial minutes enjoying the best customised experience, on seats powered with different kind of spray guns, music, and sound effects. Carbon, as we all know is one of the strongest materials in the world, much because of its covalent bonding between atoms. This chemical property makes it the strongest and the lightest material known to man kind (yeah diamonds are carbon compounds too). Take a look at this structure built by university of Stuttgart! Isn’t it amazing? Who’d believe that it was built by robots, but it was. Coming to the structure, you’d find that the more complexly woven the carbon fibers are, the stronger the structure will be The carbon fiber we are referring to here, consists of very thin filaments of carbon bound together with plastic polymer resin by heat, pressure or in a vacuum. The resulting composite material is both strong and lightweight. Bathrooms: The Relaxation Zones for ‘Me’ Time. Bathrooms have long ceased to serve a mere utilitarian purpose. They are one of the most important aspects of the house in terms of design and identity. 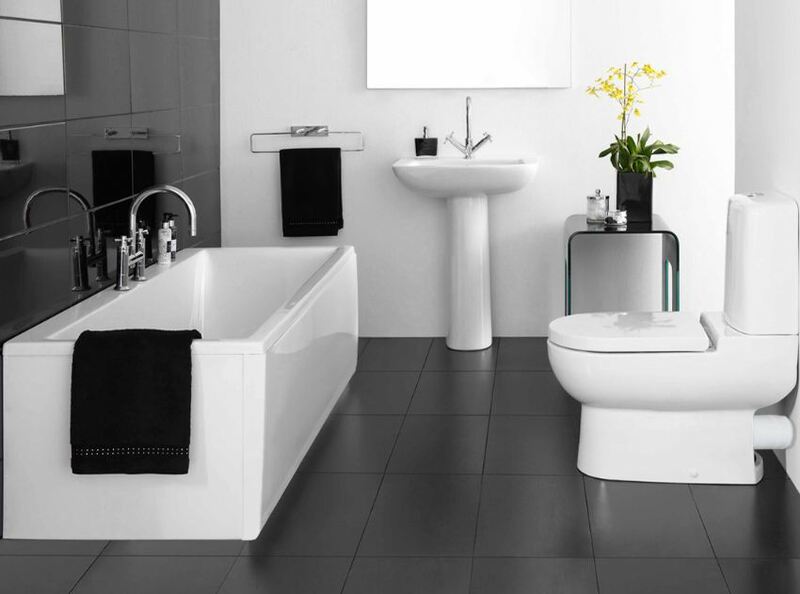 One of the most important aspects of designing a bathroom is, segregating the wet and dry areas well. If you have a long, rectangular bathroom, you should follow the linear pattern wherein the sink area is right at the entrance, the water closet next, and the bath area in the end. It’s generally a good idea to stick to the classics, while designing a bathroom. Like the showers, it is best to use steel for basic accessories like towel rods and toilet roll holders. 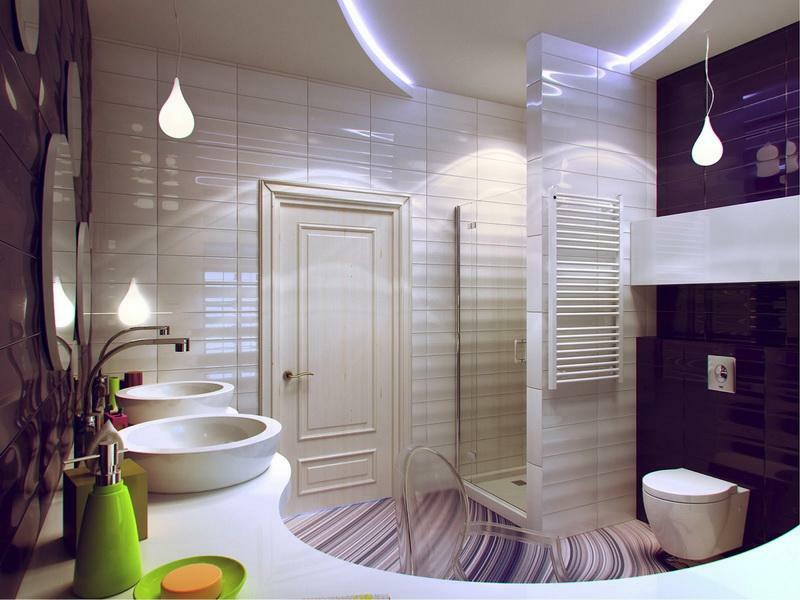 Fancy mirrors, vanity area and the lighting could set the tone. If space is not an issue, put in his-and-hers double vanity, which is the combination of the basin, cabinets and mirror. This increases the luxury quotient by many notches. While upping the style quotient, it is imperative to use water-proof material for cabinets below the basin. You could go for a dual tone on the floor and the wall tile, to add class, and introduce recessed lighting behind the mirror. While working on the style quotient, you should not compromise on the storage below the basin. You could also add shelves beside the mirror, in a stylish manner, to add to the look and utility. The colour scheme should always be based on whether you want a luxurious look or a cool relaxing look . White, beige and black-and-white are classics. You could also opt for shades of blue, green or yellow. Avoid dark tones in bathrooms, as they aren’t conducive to relaxation. While setting the tone, ensure you use a rough finish tile for the flooring, to avoid slipping when there is water. For the wall, you could opt for large glossy tiles in marble or granite and use decorative tiles to create a highlight section. Gold chip tiles are great if you want an ornate look. You could also opt for a beige and chocolate dual tone bathroom to add to the luxurious feel. 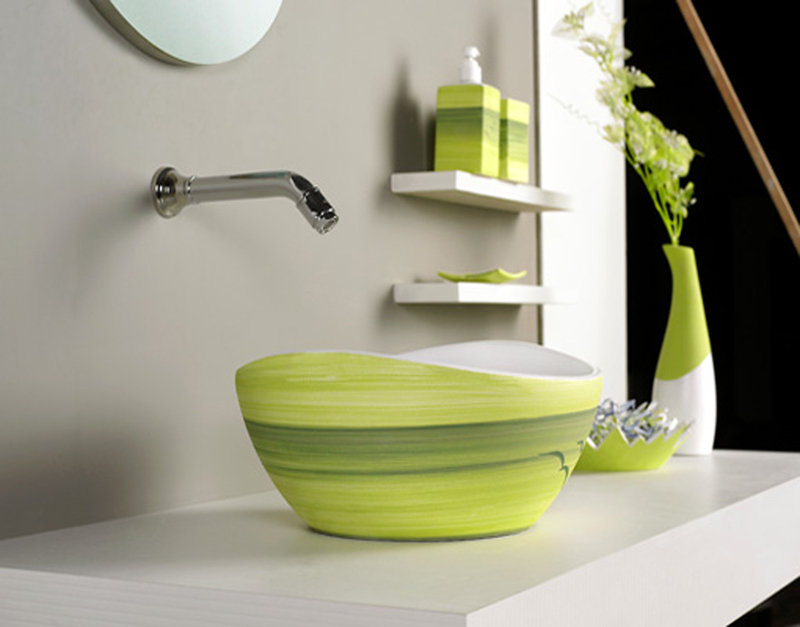 To complement your tiles and tones you could choose glass/ceramic/ stone basins. For showers and faucets, the sleek steel look is the best. For the toilet tanks and showers and taps, we suggest you choose fittings that come with water-save options. A Jacuzzi is great if you have a large bathroom, however, it is vital to ensure that the area between the tub and the floor is waterproofed well, and there are no leakages. Also the water draining path is an important factor to look at while planning the drainage of a jacuzzi and a shower panel. While a bathroom offers various design opportunities, it is also one of the most challenging parts to build. The trick to get it right is to ensure that the water and ventilation is managed well. When you are designing your bathroom leave provisions in the plumbing for future upgrades. Another important point to ensure is, that your water heaters match the capacity of your shower fixtures. So, don’t buy products without seeing them in person. Ensure that the ‘U’ bend trap is placed properly underneath every sink or toilet. Here’s what a U-Bend trap actually is. Underneath every sink or bath there is a U-bend trap, which always retains a certain amount of water, preventing unpleasant sewer smells drifting back up the pipe – the water acts as an impenetrable barrier for such smells. The same principle is used for the toilet –each time it is flushed, everything is forced round the bend in the bottom of the toilet, leaving enough clean water to act as a barrier that prevents smells. – Maintenance is perceived to be a problem but can be overcome with a well designed access panel or concealing it within a bathroom vanity… well designed concealed cisterns can be hassle free In maintenance. With these pointers, we really hope your bathroom planning is eased. Do let us know if you face any issues with the same, in the comments below, so that we can help you. The Kitchen is the most used (read: abused) part of the house. Many women and families end up spending maximum time in the Kitchen. Some use the space as a family gathering space too, while cooking elaborate meals. Others prefer quick meals or hire professionals. 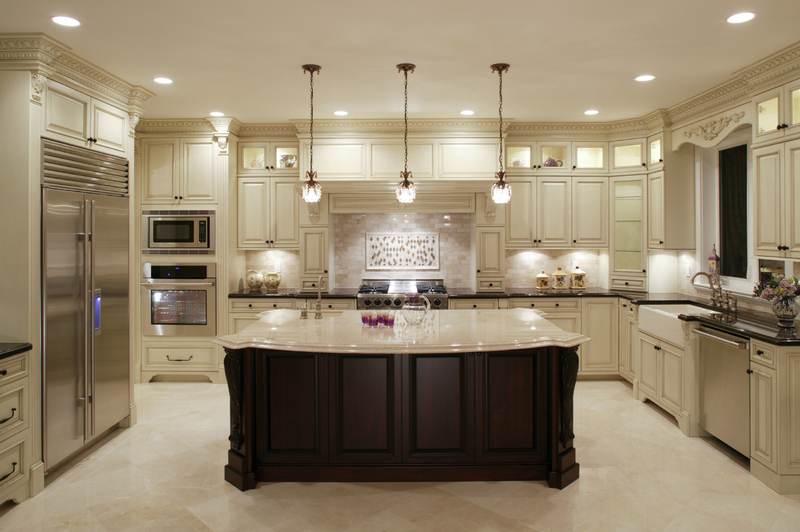 Hence each person has distinct needs which need to be catered to, while designing a kitchen. 1) Family Setup: If you live in a joint family with elderly people and children, then you should plan your storage at lower levels. 2) Will you hire professional help who will use the kitchen mostly? then you may want to store things used most by the help separately. 3) Stocking patterns: Do you stock for a week or for a month? Once you have these steps sorted, think about the work flow. Usually, a kitchen involves cooking, stocking, washing, and an area to keep prepared food. Usually these areas should not be less than 3 ft apart, to avoid a crampy look. But much depends on the space you have. The Straight Line – this is most suited for small narrow spaces. In this layout, all the work area is set against a single wall. The production chain is linear. It is cost-effective and looks sleek. However, this kind of layout does not provide for adequate work and storage space. The Galley – in this kitchen plan is flanked by work platforms on either side. Many consider this to be an ideal layout in terms of efficiency. Less movement per task. The only major drawback is that if the space is too narrow, the space would get easily crowded. 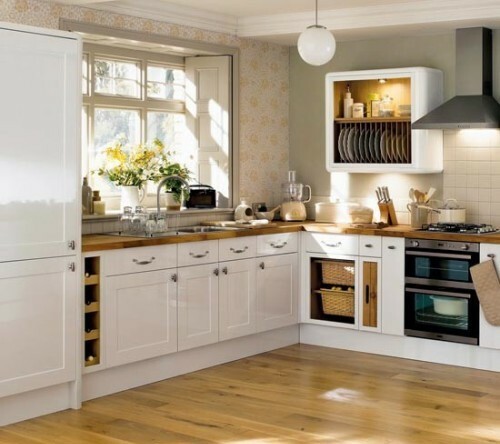 The U-shaped Kitchen – this type of design is ideal for a large space. It has platforms running along three walls, forming a U. this design provides for a lot of work and storage space. However if the space between the platforms is too wide, the travel distance during a normal cooking process will be too long and could be tiring. 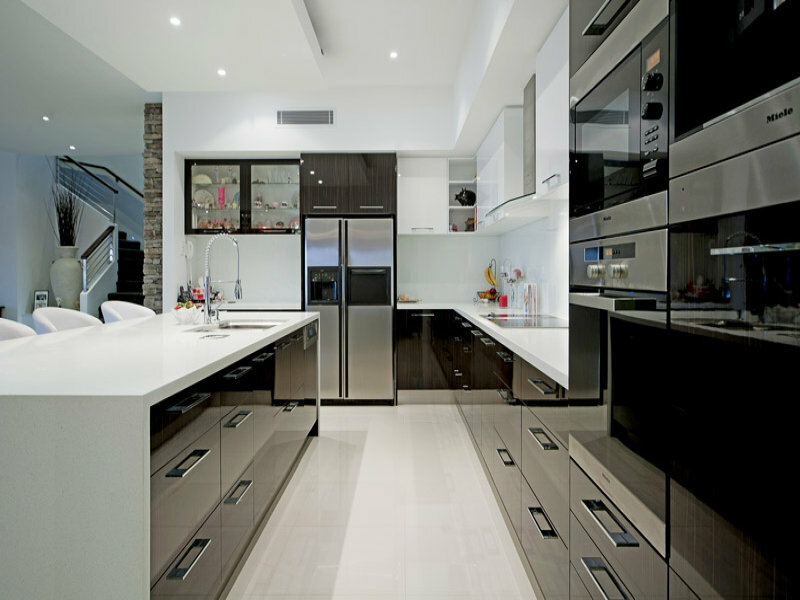 The L-shaped Kitchen – this is the contemporary kitchen design in India. The platform runs along two perpendicular walls. The principle of the work triangle can best be demonstrated in the kitchen. 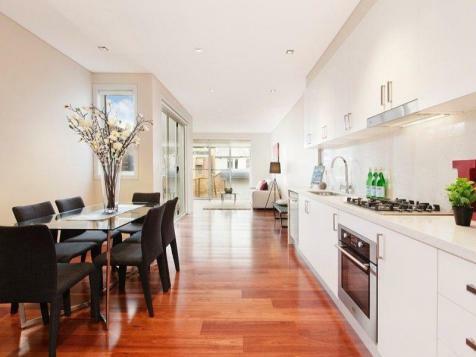 The Peninsular kitchen – again applicable to a large space, This layout has an independent counter which can be used for breakfast or snacky meals. 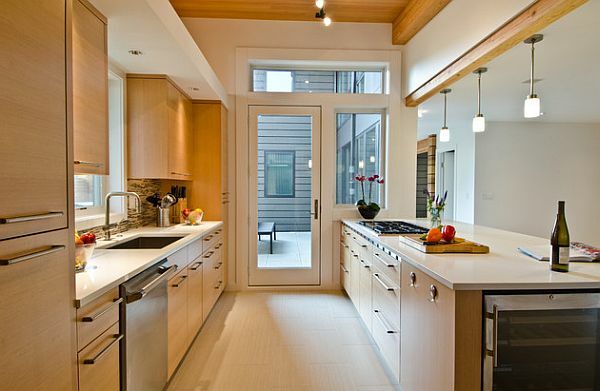 This layout works best in open kitchens. 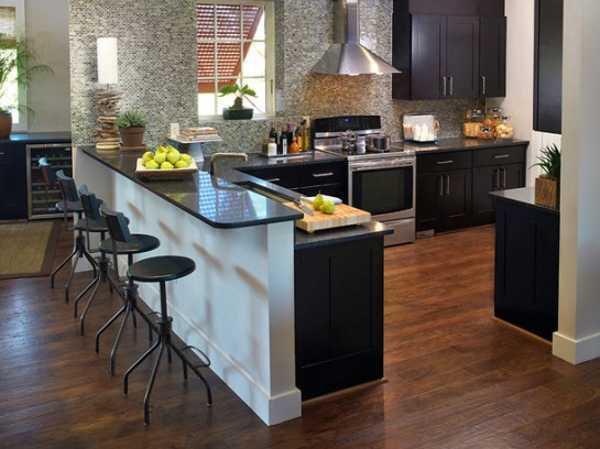 The Island Kitchen – the distinct feature of this kitchen layout is that there is a counter in the middle of the room. This type of plan requires a huge amount of space, but it works well for families that spend a lot of time in the Kitchen. Also, this layout works well in planning commercial kitchens. Here are some standard measurements you could follow as thumb rules. Since Kitchens are synonamous with smoke and fumes, one should provide for efficient ventilation and the best way of doing this is with large windows. Where this is not possible, exhaust fans and chimneys are practical alternatives.The exhaust should be placed close to the hob and should have a separate plug point. If you are planning on installing a chimney, the ducting has to be done in the initial stages of renovation itself. It should be placed directly over the hob at a minimum distance of 24″. Ideally, it should be fitted on an exterior wall. The Kitchen should be in the South-East corner of the house as the Element Fire governs in that direction. However, the North-West could be taken as an alternative. Ideally, the hob should be placed in the South-East in such a way that while cooking the person faces the East. Water should be in the opposite direction of the cooking gas. Avoid placing the dining table in the center of the kitchen, and place it in the North-west direction, if possible. Happy Kitchen Planning and cooking.